"Where the ! @#$ is the Axe effect? I've been waiting for it for over seven years. Right from my college to now in my office, no girl ever agreed to even go out for a tea or coffee with me, even though I'm sure they could smell my perfumes, deodorants and aftershaves. I always applied them in abundance to make sure the girls get turned on as they show in the television. Finally I thought I'd try to impress my lonely bai who had an ugly fight with her husband and was living alone for over a year. 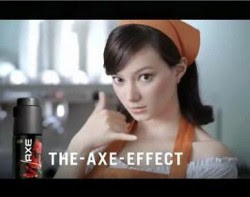 Axe effect my foot!" Vaibhav expressed his unhappiness.